TLE’s guide to five of the best luxury hotels in Barcelona is for those looking for an extravagant and memorable stay in Spain’s second largest city. Barcelona, one of the most-visited cities in Europe, is full of architectural gems, restaurants and bars – as well 4km-long, man-made, sandy beach. With a flight from London taking just over two hours, it’s the ideal city break. Whether you’re after serene rooftop pools with Instagram-worthy views or tech-rich boutiques, we’ve got you covered. Here are five of the best hotels in Barcelona. Located at Port Olympic, a short cab ride from the city centre, Hotel Arts Barcelona is just the ticket for those wanting to unwind in a lavish hotel by the sea. 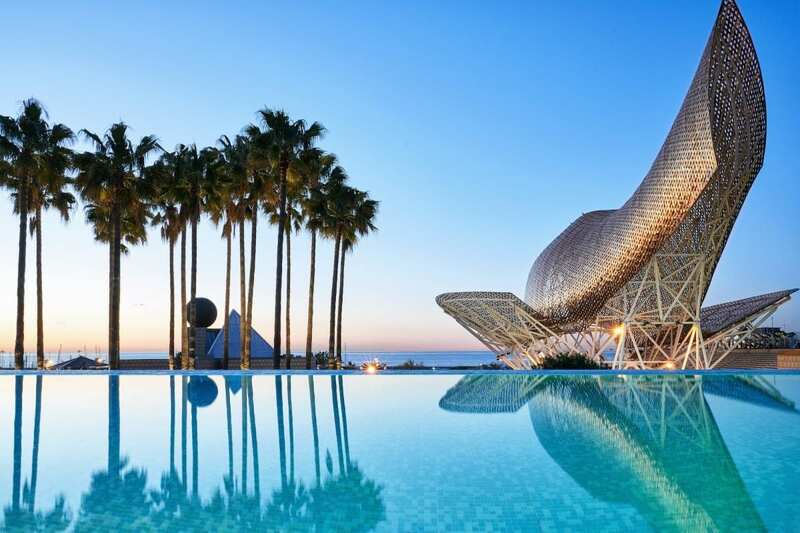 Thanks to an enormous, shimmering goldfish out front, built by sculptor Frank Gehry, the hotel is hard to miss. Rooms are simple, clean-cut and bright. But the postcard views of the Mediterranean Sea and city – both if you’re lucky or cunning enough to pre-request – are the main reward. The hotel, home to two Michelin star restaurants, an award-winning cocktail bar and an inviting outdoor infinity pool, is very hard to leave – for all of these reasons. Hoteliers at Hotel Arts Barcelona are some of the best in the world. From Diego, the resident mixologist who specialises in experiential cocktails that take you around the world in a few sips, to Lorenzo, who caters to the far-reaching needs of those in the Club Lounge with a constant, and genuine, smile on his face. 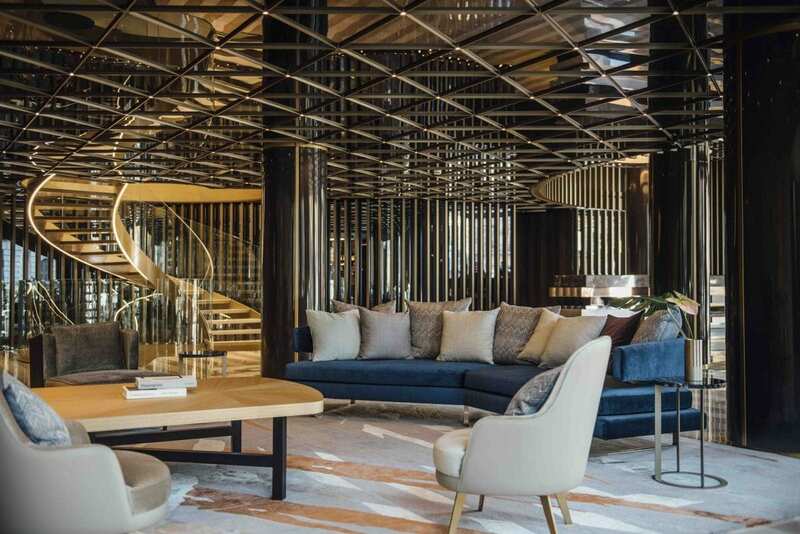 If you’re after a seamless blend of opulence and comfort with traditional customer service, check out Hotel Arts Barcelona. Rooms: Room rates start from €295 (approx. £268) per room per night. 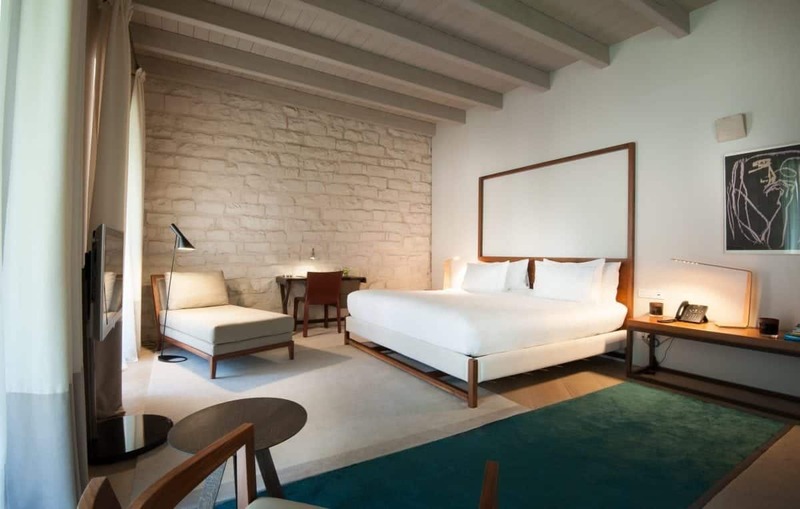 Designed by acclaimed Chilean designer Jaime Beriestain, the Almanac hotel, which only opened in February this year, offers boutique luxury charm in a relaxed, friendly setting and has more mod cons than you can shake a stick at. Located in the L’Eixample area of Barcelona, just off Gran Via, it’s in a prime location for exploring surrounding designer shops. Gold, opulent finishes, 1920s-style art décor furniture, and more textures than you can count on both hands, make it feel like something out of The Great Gatsby. Its spiralling, snail-like staircase in the lobby is a touch of architectural genius. With 61 rooms and 31 suites, ranging from standard doubles to penthouse suites, it is a hotel not attempting to appeal to the mass market. Rooms are free-flowing, luminous and technologically-rich. Each comes with a smartphone controlling everything from the electronic curtains to the air conditioning and in-room dining – and even the ‘do not disturb’ sign is digitalised. The Linea restaurant, adjacent to the lobby, is expertly skippered by executive chef, Sergio Ruiz Nieves. His team serve wide-ranging dishes – lunchtime lobster sandwiches and entrecote de lomo (pork entrecote) by night. Food is Catalonian influenced and ingredients locally-sourced where possible. The rooftop hosts 360-degree views of Barcelona, complete with a bar and a shin-deep dipping pool. The Alamanac is for those wanting to taste the future of luxurious travel. Rooms: Room rates start from €350 (approx. £317) per room per night. Made up of 28 rooms, The Mercer Hotel Barcelona, located in the city’s Gothic district renowned for its ancient cathedrals and narrow streets, is around a 15-minute walk to Las Ramblas. This hotel is proper five-star luxury. On arrival, you’re welcomed by cava and a friendly concierge team – who would probably carry you to your room on their backs if they could. The Mercer has something only the best hotels have: its own refreshing, un-identifiable smell that hits your nostrils on arrival and doesn’t leave until you do. The hotel occupies an old Medieval palace, built on top of Barcino walls of the ancient Roman city with arches and paintings (frescos) that date back to the 12thCentury. The interior, designed by prestigious Spanish architect Rafael Moneo, is a balance of old and new. Traditional-looking wooden beans, oak floors and exposed brick – painted in neutral colours – offset quirky, hanging, modernist black lights and leather belt-wrapped mirrors. And the little touches haven’t gone unnoticed. Freshly printed weather reports placed on the bedside table each night, evening patisseries, a single red rose that sits on the open-plan sink in your room and Molton Brown toiletries. Rooms come with Nespresso coffee makers, a relatively-small TV and a complimentary mini bar (minus alcohol). Breakfast is served in the hotel’s inside patio on the ground floor where you’ll be surrounded by wall-climbing plants, a handful of puffy trees and a blue sky. The food is brought to your table and ranges from various types of egg dishes (eggs Benedictine, omelettes and scrambled) to freshly-cooked pancakes. An intricately-placed fruit bowl worthy of an Andy Warhol painting and basket of bread and buttery croissants that dissolve in the mouth like flying saucers. This is a hotel for serenity and relaxation in a central location. Rooms: Room rates start from €430 (approx. £385) per room per night. Sitting in one of Barcelona’s most cosmopolitan quarters, Le’Eixample, the Hotel Alexandra Barcelona, part of the Curio Collection by Hilton, is well situated for shopping, eating out or exploring Antonio Gaudi’s architectural gems. Casa Batillo is around an eight-minute walk and Casa Mila roughly four. The interior in communal spaces is relatively un-inspiring but what the hotel’s lobby and corridors lack in gusto its bedrooms more than make up for. Modernist furniture is offset by traditional mosaic Moorish-looking, beautifully-tiled floors underfoot. And the ornate alcove ceilings fuse poetically with natural oak wood finishes. All 116 rooms come with ultra-modern showers with jets pointing every which way and iPhone docking stations. When you leave your room – and once you’ve managed to navigate your way through the black, labyrinth-like corridors – a heavenly, 500-square-meter plant-scattered patio and a shallow pool is the ultimate prize. If you’re one to work out on holiday, head to the hotel’s small gym, complete with sauna. The main reward at this hotel is its Solomillo (Sirloin) restaurant, though vegans may not agree. Solomillo serves up some of the most tender steaks in the city. The sweet carrots and cream potatoes are necessary indulgent accompaniment. Breakfast at the Alexandra is pure Catalan fair sourced locally (meats, cheeses and freshly-baked breads). Rooms: Room rates start from €183 (approx. £164 for a single) per room per night. 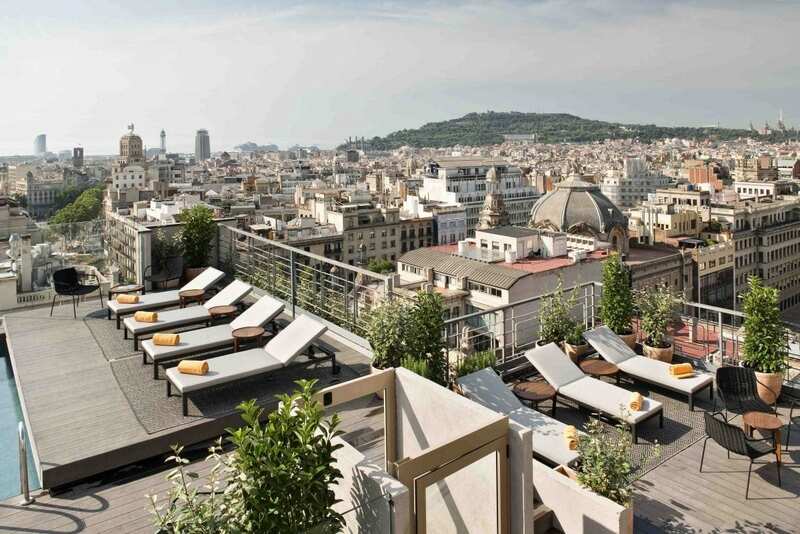 Situated within a five-minute walk of Plaza Catalunya, this luxury hotel homes one of the best views of Barcelona. Its rooftop bar and pool offer wrap-around views of the city – from the beach and Las Ramblas to Mount Montjuic and Gaudi’s famous Gothic Cathedral. Only a few minutes’ walk away is Passeig de Gràcia station, which will take you to Barceloneta in under 15 minutes (the beach is five to ten minutes from there). With rope hanging seats and a cinema-sized LCD screen in the lobby, showcasing moving images of waterfalls and other random wildlife scenes, the reception feels like the inside of a very white, cutting-edge spaceship. Bedrooms are simply kitted out but contain all the mod cons – 49-inch flat screen TVs, generous wardrobe space, tea and coffee making equipment and delightful one-button shower set to the perfect temperature. A red, Calcher, Big Brother diary-room style chair placed in front of the window swallows even larger guests (at 6 ft 2, I felt like a toddler sitting in his grandad’s chair). Breakfast at the hotel is as you’d expect – a blend of wholesome, hearty local cheeses and jamóns with modern touches in the shape of smashed avocado on toast. Rooms: Room rates start from €229 (£203) per room per night.